Mix mayonnaise and lime juice in a small bowl until combined. 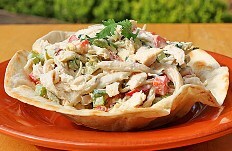 Toss chicken, celery, onion, bell pepper, cilantro, and jalapeños in a large bowl. Add the mayonnaise mixture and toss until evenly coated. Season with salt and pepper to taste. Serve or cover and refrigerate for up to 2 days.